This Coleman Inflatable Kayak is one of the best inflatable kayaks and is an excellent fishing kayak. Its design and maneuverability enable it to access out-of-the-way fishing spots and backcountry waters otherwise only accessible by hiking on foot. It is very stable so detecting strikes isn't a problem and pulling fish won't tip it. With its color and stability, it moves silently and doesn't spook the fish. You will definitely catch more fish fishing out it. As an angler, you will also appreciate the rod holders and the ability to attach a trolling motor. Have reservations about using an inflatable kayak for fishing? This is not your average vinyl kayak. It is easy to store, transport and use and is also one of the strongest and most durable soft kayaks. You can fish out of it without worrying about it puncturing. You can even bring your dog along without fear that its nails will puncture it. 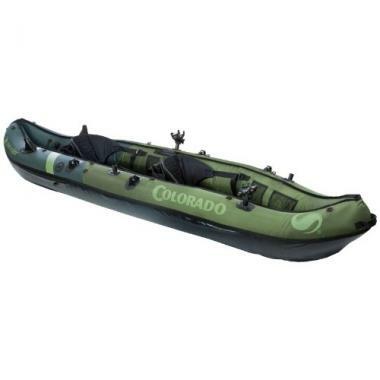 If you're wondering how suitable and reliable this kayak is as a 1 or 2 person inflatable fishing kayak, our comprehensive review has all the information you need to make an informed decision as to whether the Sevylor Coleman Colorado 2 Person Fishing Kayak is the right choice for you. Three-layer construction makes it tough and extremely resistant to puncturing. A tough 840D nylon top and a thick 1000D tarpaulin bottom protect the inflatable chambers from all kinds of elements from punctures to the sun’s rays. 18-gauge PVC construction makes this a rugged kayak. Multiple air chambers make up this inflatable kayak. If one chamber is punctured and deflates, the kayak will still remain functional so you can get back to shore and fix it. The kayak is an airtight, leak-free system composed of a tough top material and rubber-like bottom that don’t let water in and strong, leak-free stitching. Berkley quick set fishing rod holders that are adjustable enable hands-free fishing. Paddle holders hold the kayak paddles securely when you need your hands free. Sevylor trolling motor mount offers a place to attach the Sevylor trolling motor to expand the kayak’s capabilities, improve its performance and make it even more fun. A Boston valve that is double threaded makes inflating and deflating this boat less work. Seatback pockets and mesh storage pockets on the sides keep gear and drinks easily accessible and D-Rings allow for attachment of other items. The seats are adjustable and this kayak has carry handles so carrying it to and from the water is easy. Inflated Length: 10 ft. 9 in. Inflated Width: 3 ft. 3 in. Usability: This Coleman Inflatable Kayak is very easy to inflate, paddle, deflate and store when done. It is at its best in calm waters in rivers, lakes and even bays. Paddling it in strong currents and choppy waters is quite the workout. It works great for fishing but is also great for recreational kayaking and camping trips. Portability: Lightweight and foldable, this kayak is very easy to transport. It packs into a carrying bag and you can keep it in the trunk of your car and carry it everywhere you go. If you have to pack your car a long way from the water and hike part of the way to get to your favorite fishing hole, the bag makes carrying it easy. When fully inflated, the handles make it easy for one person to carry it into and out of the water. You don’t have to worry about storage space or kayak storage racks with this one. Inflation: Thanks to the double-threaded valve, inflating it is easy and takes less than 10 minutes. Inflating it correctly is very important and the good thing is that it comes with a pressure gauge. What it doesn’t come with is a pump. We recommend getting a decent 12V pump, preferably with a built-in PSI gauge. Always remember to attach the tracking fin it comes with before inflating it. Break Down: This takes a little more time and effort than set up. You have to rinse and dry it first. If you use it in salt water, it is especially important to rinse it with fresh water. When drying, the sun’s heat can weaken the stitching on the bottom making it leaky. It is important to avoid exposing the rubber bottom to the hot sun for prolonged durations. Once dry, just deflate, fold and shove into the carrying bag. Capacity: This Coleman Inflatable Kayak is designed as a tandem fishing kayak. It has two seats and its upper weight capacity is 470 pounds. Two average sized paddlers fit in very well as long as they have carried only light fishing gear. It can also work as a kayak for camping for one person with their camping gear. The seats are on the small side for big guys. For gear, there are pockets on the seat backs, mesh pockets on the sides and D-rings for attaching items. Performance in the Water: The Sevylor Coleman Colorado 2 Person Fishing Kayak is very stable. It doesn’t feel tippy even with two people and their gear on board or when pulling a strong fish. It moves pretty first and is also easy to maneuver. It tracks well, thanks to the detachable fin, though not as well as a solid kayak. It is a struggle to keep it straight in the face of wind or currents. It tends to catch the wind and drift. This kayak is wide and tall so it is important to get long kayak paddles. Fishing Out of It: Its design, stability, and maneuverability enable this kayak to get to out of the way fishing spots without having to hike part of the way. With its color and stability, it glides smoothly and silently and doesn’t spook the fish. As for sitting and waiting, both anglers can adjust their seat so it is comfortable. However, the low seatbacks don’t offer sufficient back support and these seats are not comfortable for long excursions. The adjustable Berkley Quick Set rod holders enable hands-free fishing. Paddle holders secure your paddles when you need your hands for fishing. You can also attach a trolling motor for kayak to improve this kayak’s capabilities and make it more fun. This kayak’s biggest flaw is that the rod holders get in the way of paddling. Paddlers have to row further out than is comfortable to avoid hitting the holders. You can overcome this weakness by sitting on a cushion so you sit higher and avoid hitting the rod holders when paddling. Materials: 100% – The 18-gauge PVC, 1000D tarpaulin bottom and 840D nylon cover are top notch quality materials that make the Sevylor Coleman Colorado 2 Person Fishing Kayak one of the strongest and most durable inflatable kayaks. Even dog nails won’t puncture this one. It is still important to be careful with lures and hooks though. Design: 95% – The kayak’s design works very well for fishing, especially for getting to hard to access spots. Multiple air chambers mean that you can still get back to shore safely in the event that one chamber is punctured and deflates. The design makes it look like a canoe. Price: 100% – This is an affordably priced kayak. For the price, this fishing kayak is hard to beat given convenience, performance, durability, and that it is a tandem kayak. It offers a lot of value for money. Overall: 98% – This is a really well-made kayak and one of the best inflatable kayaks. The material is strong, the design well thought out and executed and the kayak holds up very well. For an inflatable kayak, you can’t beat the quality, durability or price of this one. If portability and ease of storage are your top priorities, then this is the kayak for you. With its stability, maneuverability, rod holders, puncture resistance and trolling motor mount, this Coleman Inflatable Kayak is one of the best inflatable fishing kayaks. Kayak fishing with a friend or romantic partner is a great way to spend time together having fun and bonding and this 2 person fishing kayak is perfect for that. It also works as a one-person boat for angling or camping. It is good for paddling around on the water for recreation, although the rod holders getting in the way of paddling can ruin the experience. Sevylor makes good kayaks and canoes and this is a quality inflatable kayak that should last years with proper care. 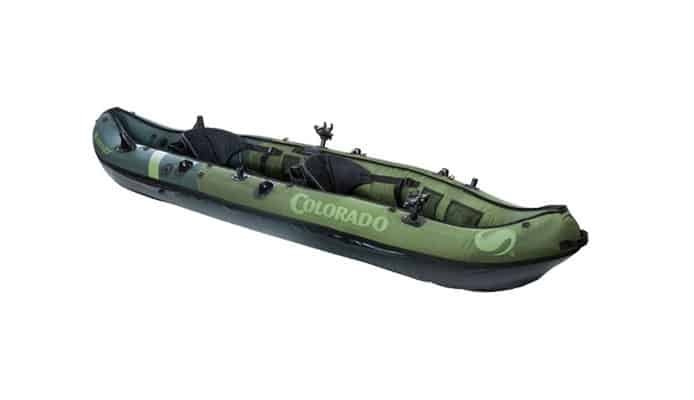 Does the Sevylor Coleman Colorado 2 Person Fishing Kayak sound like the perfect kayak for you? Let us know your thoughts in the comment section below. This Coleman Inflatable Kayak is one of the best inflatable kayaks and is an excellent fishing kayak.